Truffle's 2nd birthday ... he posed for the photo, wearing his Christmas hat ... so maybe he's not so very naughty. Lol. Fab photo TT :) Happy birthday Truffle! 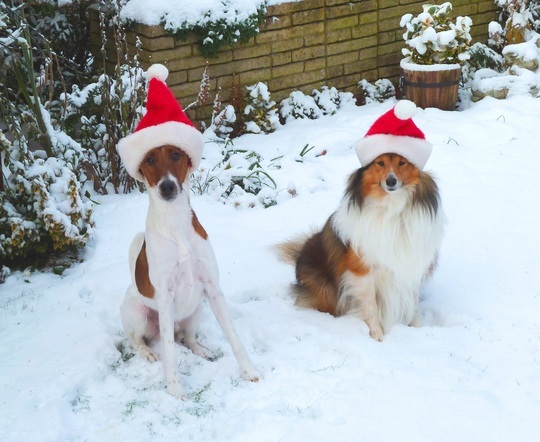 You two are so cute in the hat　:-) Must have been shivering cold out there in the snow; nice one, doggies, you are stars! Thank you Paul and Tommy ..
Quite a challenge to get both of my dogs to sit with their hats on ... Conker will always pose nicely, but Truffle was ready to dig some more snow ! lol. Lovely photo TT :o)) It's nice to see both dogs having a great time ! Truffle thinks the Christmas celebrations and decorations are all for his birthday...LOL. :-))))) great picture TT, they both always pose so beautifully for all your pictures, or are they frozen to the ground,lol. Lovely TT, good to see Truffle joining in the idea of his photo being taken in all sorts of guises although he does look as though he'd like to escape any minute. Conker is obviously a great teacher. Thank you Bjs and Sandra .. Happy B day to you ! Happy Bithday Truffle, you do look grown up now, hope you are sharing your birthday toys with Conker, have fun! Truffle let Conker have a play with the new squeaky toy ! ... that's good for him... lol. Happy Christmas to you, Truffle, Conker and Crocus, and happy birthday to Truffle! I hope Truffle didn't have to pose too long on that snow. Conker has a nice thick coat to take care of the more delicate parts. I'm sure Truffle had a lovely 2nd birthday~but he says please mum...... make sure it's a heatwave next time. Wonderful photo, our dogs won't sit still for a second! happy birthday to Truffle! great photo! Those Spindle trees(Euonymus) are pretty hardy Tt, as long as the soil in the pot is nice and firm with no frost pockets! What a fantastic photo! 2 Santa Doggies! :-)) You are so clever, TT, to get your dogs to pose like that! Most dogs would take off & probably chew the hats! Belated birthday greeting to Truffle! Happy Christmas to you & the dogs & your family. P.S. : Our daughter has had a baby boy, James. We are going to their house this evening to see them. Well TT, that photo is certainly merry and bright, Truffle looks wonderful posing for his 2nd Birthday and as usual Conker is taking it in his stride. Bet Crocus was whistling a merry tune indoors. ... Congrats on baby James... grandson .. what a lovely Christmas present ! Merry Chirstmas Terratoonie, Conker, Truffle, Crocus and may you have a wonderful new year too.xxxx Lovely cute photo. My dear TT, Merry Christmas!!! Thanks for the congratulations. TT! Mum & baby now safely at home. We went to visit them yesterday & got some photos. Look out for a picture or two of James & me. Thanks, TT. I've posted a photo in my Photos & I've written a short blog with the photo included. Season's Greetings - A Happy New Year when it comes to you Terratoonie - we've maybe got a thaw on today, unless we get another dump of snow overnight! I could just about see grass after lunch... well nearly! Conker is a pro..my bro's Mojo is just like him..but a terrier with a hat on...I would've said impossible especially at 2yo..they are usually wriggly puppies until they get MUCH older ..like 11 or 12! Amazing!! and totally gorgeous, my OH loved it too. Be assured that Truffle is still VERY lively ... in between the occasional sensible moment...lol. Thanks so much Sticki .. I hope you had a lovely Christmas ..
beautyfull photo definately in my favorites, thankyou for the pleasure. I'm so envious. stunning garden and ab. fab. doggies. Feel inspired now. I've built up my gardens a bit at a time..
okay, is there no limit on cute here?